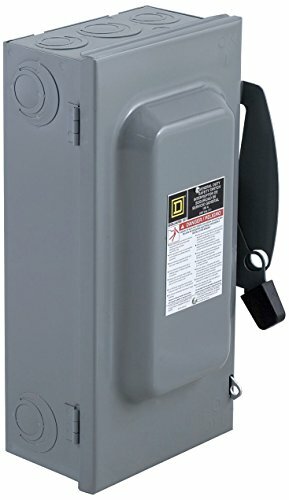 The Square D by Schneider Electric 100 Amp 240 Volt 3 Pole Indoor Not Fusible General Duty Safety Switch is designed for residential and commercial applications where durability and economy are prime considerations. Typical loads are lighting, air conditioning and appliances. This switch is suitable for use as service entrance equipment when equipped with a service grounding kit. The switch is UL listed, File E2875, and meet or exceed the NEMA standard KS1. For more than 100 years the Square D brand safety switch has been the unchallenged leader in the market. We've continued our tradition of innovation, developing new features that provide an unsurpassed level of performance, reliability, safety and ease of installation. This tradition has resulted in the Square D brand being preferred two to one over our closest competitor.